In the past month the Blog has posted an article about crime in the NFL, and another article about stiffer gun laws in Maryland becoming effective. Coincidently, this past week a story broke that combines these two issues; the NFL has now adopted a stiffer gun policy. As of this past Sunday, off duty police officers are no longer allowed to carry their firearms into NFL stadiums on gameday. The policy had previously allowed off duty cops to carry their weapons into the stadiums provided they used a special entrance, and notify NFL security of their seat location. The league did not provide specific reasons for instituting this new policy midway through the season, and police unions and law enforcement officers around the country have expressed widespread frustration about the change. In some cases this new rule directly contradicts police department policy and even state law. 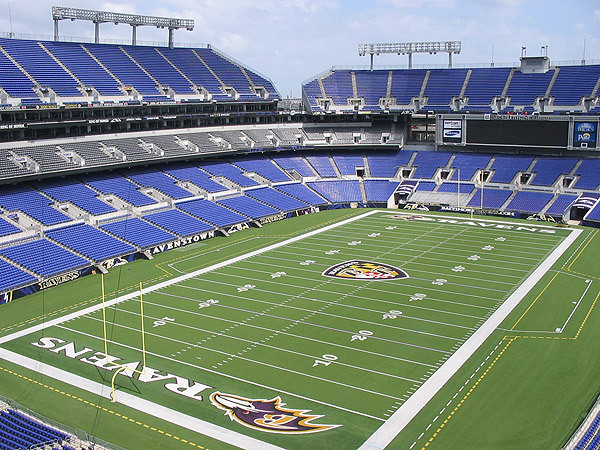 Ravens stadium is within the jurisdiction of the Baltimore City Police Department, which requires its officers to carry their service weapon at all times while in the city limits. This is regardless of whether the officer is on or off duty. The new NFL policy does not permit teams to use their discretion in enforcing this rule, unless the rule runs contrary to state law. As a result the rule trumps the Baltimore Police policy, and off duty cops will not be able to attend Ravens games with their firearm. The department has expressed its share of displeasure with the NFL, and continues to maintain that armed off duty officers are essential to the safety and security of the public. But the NFL responded to this argument generally by citing concerns that off duty officers are not briefed on gameday law enforcement strategies and emergency response plans. Additionally the league stated off duty officers are not subject to the same restrictions as on duty officers. For example off duty cops are permitted to drink alcohol. Regardless of the league’s preference, off duty cops will continue to carry their firearms at all Cowboys and Texans home games. Texas state law requires off duty cops to carry their weapon, and be ready to protect the public at all times. Both sides of this issue present logical arguments, but in reality it’s hard to envision a situation where one side will ever be proven right or wrong. The chances that an off duty cop would allow his or her weapon to fall into the wrong hands, or actually use the weapon improperly are extremely low. At the same time though the chances that an armed off duty officer would be called upon to use his or her weapon at a game to protect the public are low as well. Therefore, it just seems odd that the NFL would make this policy change. Why not just keep it status quo? For a billion dollar business that is obsessed with its public image the change makes little sense. How many people actually knew or cared one way or the other that off duty cops were armed at games? But now with the change, people are angry and even insulted, and the league is making headlines for the wrong reasons. The Blog will continue to follow this new policy, especially as it relates to games in Baltimore, and may post a follow up article in the future. Benjamin Herbst is a Baltimore weapons crimes lawyer, who handles all types of criminal defense cases. Contact Benjamin for a free consultation about your case.